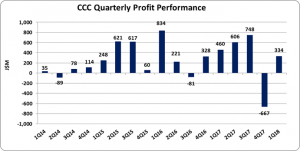 Caribbean Cement Company Limited (CCC) for the three months ended march 31, 2018 reported total revenue for the three months ended March 31, 2018 grew by 6% amounting to $4.34 billion, up from $4.09 billion reported a year ago. Depreciation and amortization closed the period at $126.19 million (2017: $134.17 million). As a result, operating profit totaled approximately $479.78 million (2017: $550.17 million) for the period, a decline of 13% year over year. Interest Income for the three months ended amounted to $4.88 million, a gross increase of 165% when compared to $1.84 million for the corresponding period in 2017. Finance Income for the three months closed at $25.80 million compared to a finance cost of $24.16 million incurred for the corresponding period of 2017. Consequently, Profit before Taxation for the period amounted to $510.45 million, 3% less when compared with a profit of $527.85 million recorded last year. Taxation for the period increased 161% from $67.48 million reported for the first three month of 2017 to $176.13 million. Net profit for the first quarter closed at $334.32 million relative to net profit of $460.36 billion booked for the corresponding quarter in 2017, a decrease of 27% year over year. Total comprehensive income for the period closed at $347.81 million, relative to $460.36 million for the corresponding period in 2017. Consequently, earnings per share (EPS) amounted to $0.39 (2017: $0.54), while twelve months trailing EPS is $1.20. The number of shares used in this calculation was 851,136,591 shares. CCC stock price closed the trading period at a price of $38.97 on April 25, 2018. Total Assets grew by $1.84 billion or 17% to close at $12.91 billion as at March 31, 2018 (2017: $11.07 billion). This increase in total assets was largely due to the $2.86 billion increase in ‘Property, Plant and Equipment’ which closed at $9.63 billion (2017: $6.76 billion). Cash and Cash Equivalents also contributed to this increase with a 93% increase year over year to $1.05 billion (2017: $544.43 million). Shareholder’s equity totaled $9.30 billion compared to the $8.20 billion quoted as at March 30, 2017. This resulted in a book value of $10.93 (2017: $9.63).